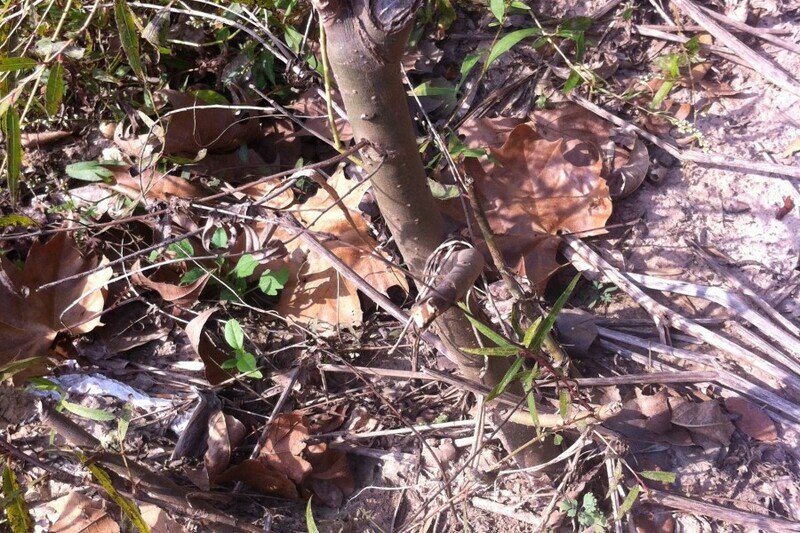 Who’s Cutting the Black Willows on Buffalo Bayou in Memorial Park? Updated Dec. 24, 2014. Mystery solved! See below. 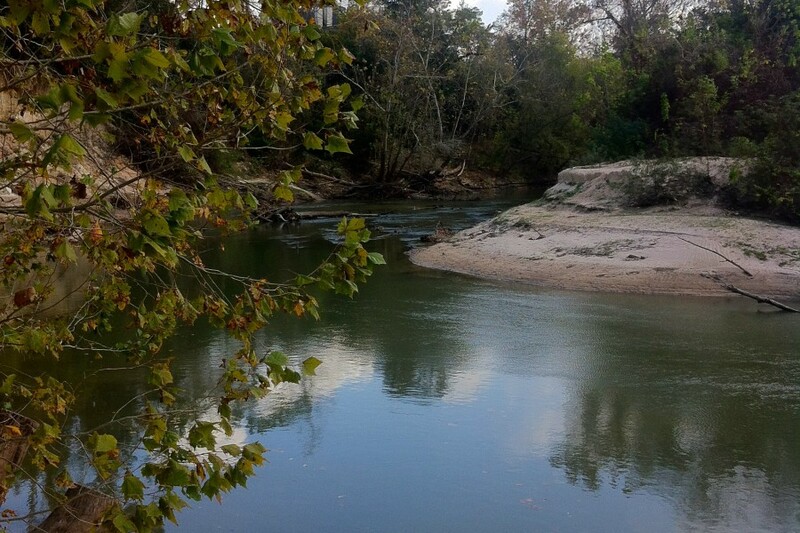 Revisiting a beautiful meander last week in Memorial Park we came across something strange. 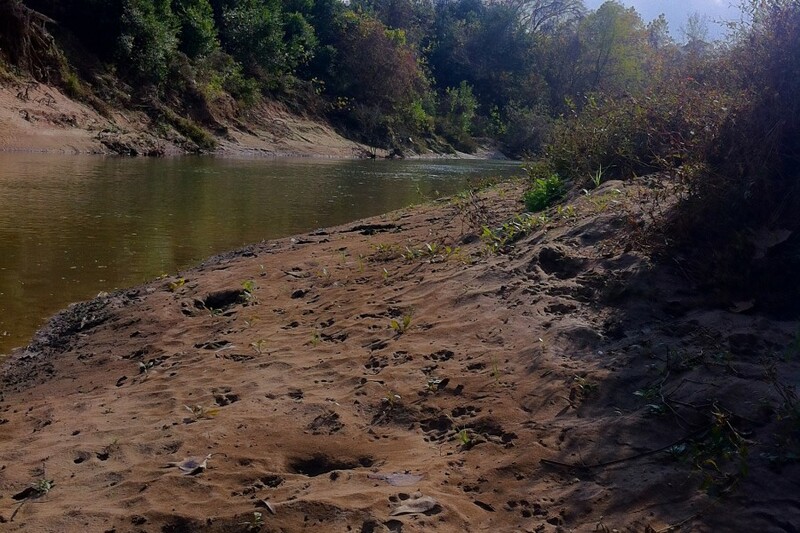 This is what we call the middle meander in the area of the Harris County Flood Control District’s project to bulldoze the riparian vegetation, dredge and channelize one of the last natural stretches of Buffalo Bayou in the middle of Houston. You can see photos taken earlier in October of this lovely spot. 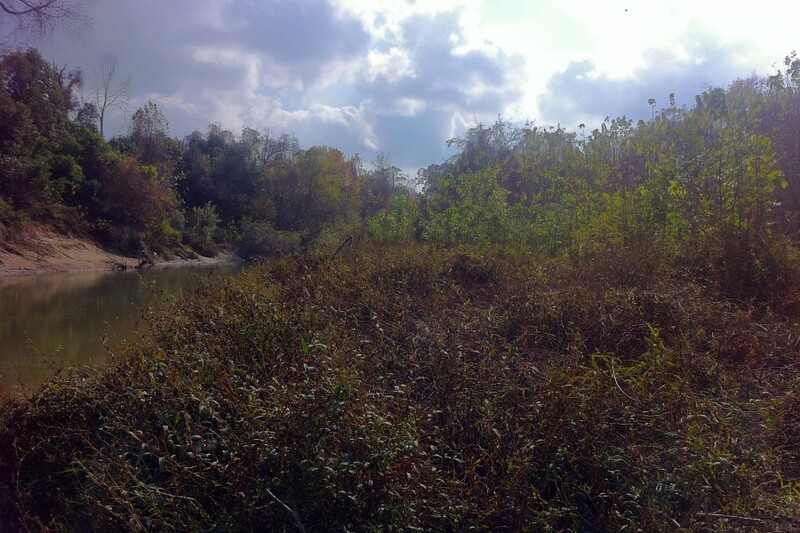 This is a flat, marshy area of the north bank, filled with wildlife, mullet jumping and landing on their backs, where the bayou has gradually shifted to the east and has been naturally revegetating the sandy banks with native smartweed, ground cherry, boxelder, black willow, and sycamores. Here is what it looked like last week. 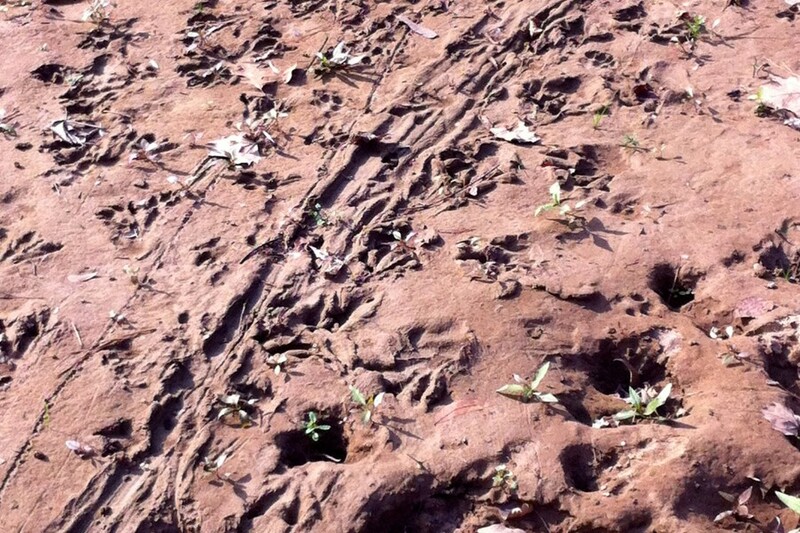 Wildlife tracks in the mud on the middle meander to be destroyed. Photo taken Dec. 15, 2014, by Susan Chadwick. This area will be totally obliterated by the flood control district’s “erosion control” and “bank stabilization” project, known as the Memorial Park Demonstration Project. The bayou here will be filled in, the magnificent, very old cliffs defaced and leveled, and the bayou rerouted further to the south. Why? Because that’s what the flood control district imagines the bayou will do 200-300 years from now. So we taxpayers are paying $4 million to do all the damage now that the bayou might possibly do in several centuries. The odd thing was that someone has been cutting down the native black willow saplings that are growing up on the sandy bench in this area, creating a new riparian forest so necessary for controlling erosion, stabilizing the banks, cleansing the water, and providing wildlife habitat. Who would do that and why? 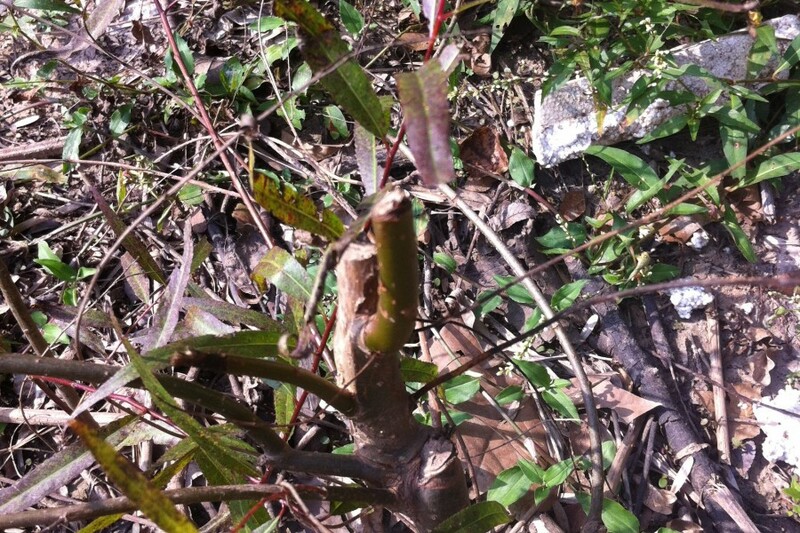 Native black willow sapling chopped, apparently by a beaver, it turns out. Experts have pointed out the tooth marks that a beaver makes. All photos taken Dec. 15, 2014, by Susan Chadwick. Another native black willow cut by a busy beaver. 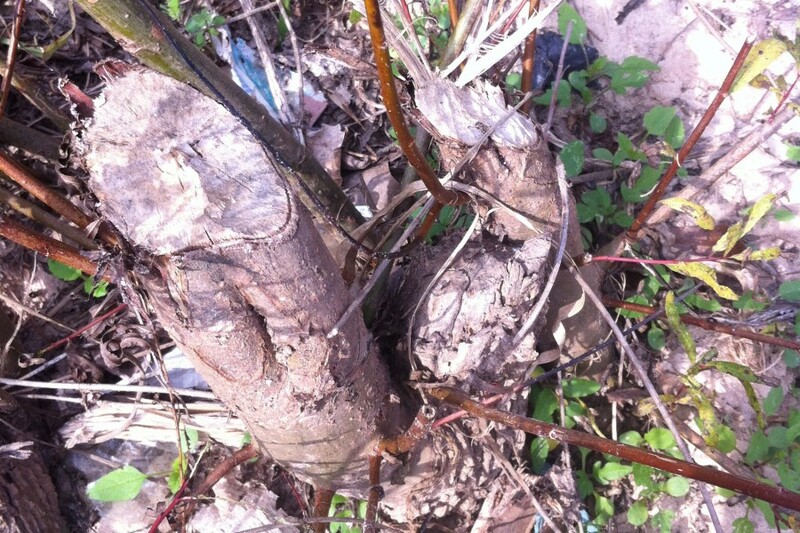 These are the trees that a healthy bayou naturally plants to create a new riparian forest, but beavers need homes too. Another young black willow cut down for a beaver development. The probable track of a beaver, apparently dragging a harvested black willow sapling to the water for home building material. And are those beaver footprints with the long toes?